There are similarities and differences between all bands but, whenever a new group comes together, that inner search for what makes a group of people stand out becomes a crucial point of identity right from day one. What the unveiled answer to that question turns out to be varies, and the things at play stretch far beyond just the music and-or-lyrics. The “it factor” is short but catchy melodies for some and it’s a hyper-engaged live performance for others. Still, for others, their origin story or, their instrumental makeup are the standout factors (See exhibit A: South Korean post-rock band Jambinai). In the case of the multi-state based, progressive, alternative rock band, Hotel of the Laughing Tree (affectionately known just as “Hotel” by its fan base), what often serves as the quintet’s characteristic ace of individuality is the one-two punch of their uncommon compositional style and a conceptual base thickly covered in idiosyncratic storytelling and analogies. Each of the band’s existing albums to date has found a nesting place located far from the reaches of description that would prompt a label executive to say, “I could hear anyone recording these songs.” Instead, listeners are presented with songs that have no qualms defying the trending production, instrumental, lyrical, and practical writing choices of bands being granted far more reach simply because something fits in a neat and tidy three and a half-minute box. The last full length effort by Hotel of the Laughing Tree, New World Sundown (independent, 2015) was revealed about two and a half years back and, in that time, the group went from being all in one place, to crossing state lines, balancing side project ventures, and working to find a system that would allow the still emotionally and musically committed pack to make albums as Hotel, rather than just throwing in the towel and folding the band. Such an undertaking is no easy task but with the arrival of Hotel Junk Box, these gentlemen reaffirm to the world that they: 1) haven’t forgotten everything that led them to this point and 2) are as enthusiastic as ever about creating new songs and releases together, even if it can’t be at the same pace or with the same approach from albums past. It’s a shame that the title of this behemoth, 19 track, record refers to its contents as “junk” because although the majority of the material on hand has been unearthed from Hotel’s archives, this compendium of vintage recordings is hardly a project assembled from a place of desperation or as an apathetic placeholder, like one might presume something junky might be. 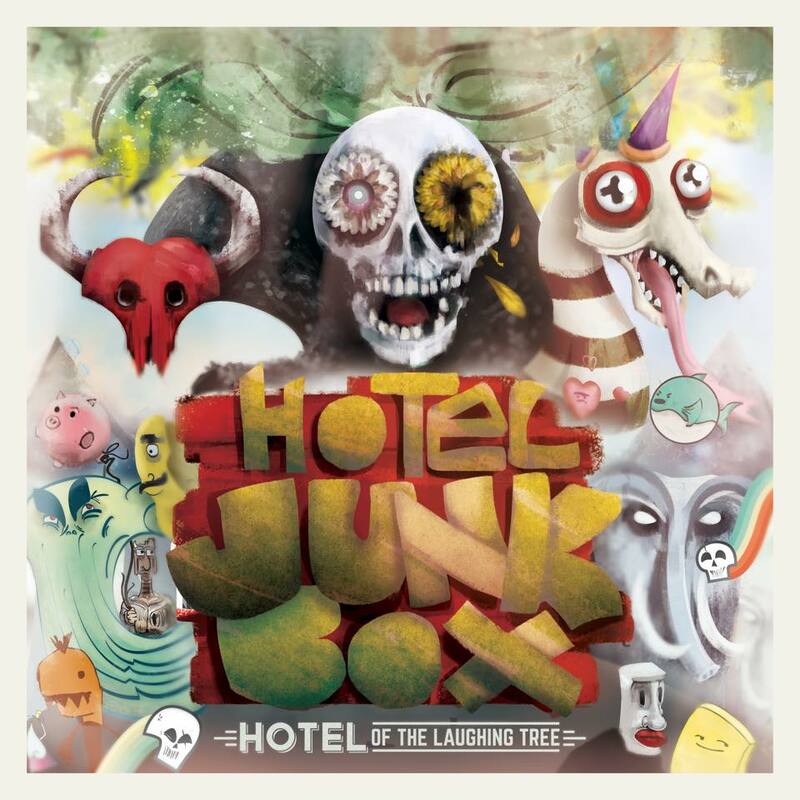 Starting with the fact that Hotel Junk Box contains, at the very least, an EP’s worth of brand new songs, shows that Hotel fully embraced the secondary intention of releasing older demos, live recordings, and acoustic drafts under the umbrella of excitement about the band’s own history. Lead guitarist, Brandon Peterson even states that acknowledgement of length and fan commitment was a key factor in choosing to make the album an album rather than just releasing the five new songs and calling it a day. “We wanted to compile a lil somethin’ for all you cats who have been around since the beginning,” Peterson says in a recent post from Hotel’s official Facebook page. That simple declaration alone, changes the vantage point for how all these tracks fit together when first approached. Sure, they’re all older and early versions of material but beyond that, the massive offering provides older and new fans both, a very elaborate picture of the landscape that Hotel has been traversing – emotionally, sonically, spiritually, and interpersonally speaking – since the time of their debut record, Old Dominion (independent, 2009). Just the artwork alone, (a component that remains a hallmark of Hotel’s releases since the beginning) stands out front like a colorful throwback of the group’s collective discography; each character or element given a modified, artistically reprised touch by Estrada – Hotel’s artist in residence. Containing demos that revisit every period of Hotel’s recording timeline – from rough around the edges takes on unusual New World Sundown picks like the doo-wop fueled “Duo,” to a very open and instrumentally breathable live workshop stab at “Bad Canterbury” – a popular track off their critically acclaimed debut full length, Terror and Everything After (Brookvale Records, 2011) – there is much replay value to be had with Hotel Junk Box. After taking in everything brand new about Hotel Junk Box, the high replay value mentioned above comes from what one choose to keep at the forefront of their mind when circling back to track one. Knowing that the album weaves in and out of different years and previous releases, it’s interesting to just observe the straight growth of each demo or acoustic version of a song, to its ultimately finished counterpart. Then, to the hear the tracks and again, observe, but this time focus on the way Hotel approached their initial recordings from year to year translates to a whole different listening experience, as the band undeniably changed and gained cohesiveness over time, which affected the group’s approach to even cutting initial demos. Truthfully, there is a cornucopia of history to be not only relieved here in familiar songs, but for anyone who wasn’t present during the making of these cuts, to be realized for the first time. Indeed, for those especially who have followed Hotel of the Laughing Tree since its inception, a massive musical reveal like this isn’t a pile of leftovers. It’s an expanded view of the band’s creative history. One could even call it something of an extended stay at the Hotel of the Laughing Tree. Note (3 July 2017): A previous version of this article stated Brandon Peterson was lead vocalist of Hotel of the Laughing Tree. Peterson is the lead guitarist.